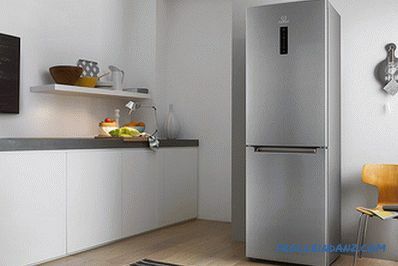 Modern manufacturers offer a wide variety of models of household refrigerators, which differ not only in their design features, but also in their working principle. It is often quite difficult for a consumer who does not understand the technical intricacies of such equipment to select a device that would fully meet its goals. 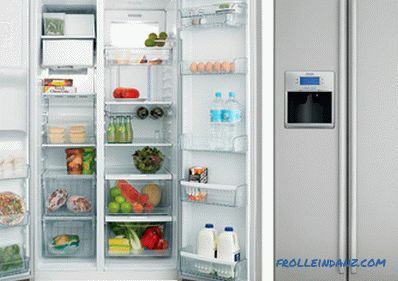 From this article you will not only learn what refrigerators are, but also get comprehensive information on the functional qualities of various household refrigerators. 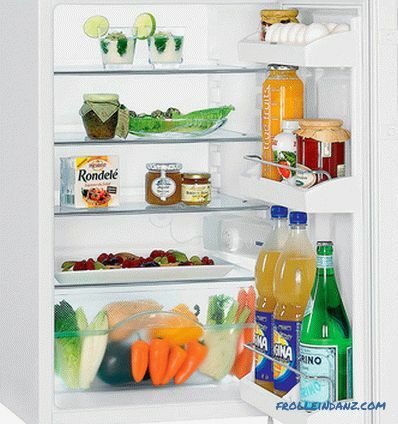 The cooling system is the main component of the refrigerator. 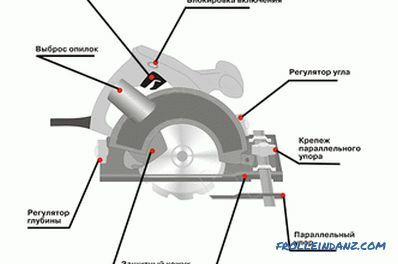 There are several cooling systems, each of which has its own device and principle of operation. 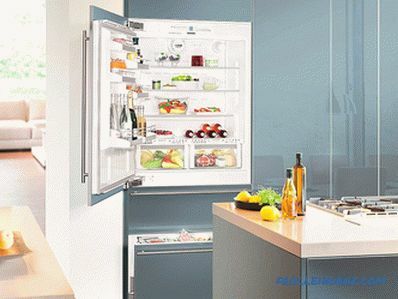 Depending on the type of cooling system, refrigerators are divided into compressor, absorption and thermoelectric. Refrigerators with a compressor cooling system are the most common and most commonly used in home appliances. They are the most economical, and, at the same time, can be quite voluminous. In refrigeration systems of the compression type, the refrigerant is circulated through the operation of the compressor, when pumping in which the cooling fluid is compressed. Mostly similar devices are equipped with one compressor, which is responsible for lowering the temperature both in the refrigerating chamber and in the freezer. However, there are also two-compressor models that have two cooling circuits, which allows, if necessary, to turn off a separate chamber or set the required temperature in it. Under certain circumstances, this makes it possible to also save on electricity consumption, for example, leaving only the freezer to work. It should be noted that the cost of devices with two compressors is much higher. However, in most cases, they do not have the No Frost system that controls the defrosting process, due to which regular defrosting of the refrigerator can be avoided. Recently, single-compressor models having a dual-circuit cooling system have begun to appear on the market. In this case, it is assumed that there are several evaporators and a special control system that is responsible for the selective direction of refrigerant movement. In refrigerators of this type there are no compressor installations. 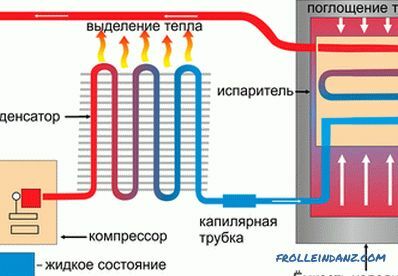 Coolant circulates by heating the heat exchanger. Such systems are mainly equipped with devices of small and medium sizes. Compared to compression models, they are not economically efficient in terms of energy consumption, but they consume significantly less resources than thermoelectric models. During the operation of absorption type refrigerators, alternative energy sources can be used, which is, in fact, their main advantage. In particular, it is possible to operate the system on liquid or gaseous fuel. To date, there are combined devices that can operate both at the expense of electricity, and consuming liquefied gas. At the same time one five-liter cylinder with a propane-butane mixture lasts an average of 230 hours of operation of the device in continuous mode. 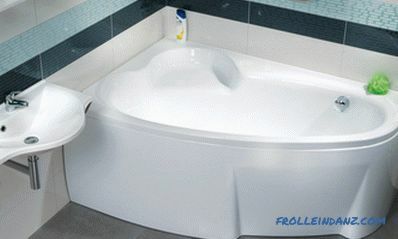 In such a cooling system, the temperature is reduced according to the principle of direct absorption of thermal energy. There is no refrigerant circulating around the circuit. The function of coolers is performed by semiconductor plates through which electric current passes. The result is a cooling of the inner side of the element, and, accordingly, the heating of its outer part. As the current changes, the same processes begin to occur in the reverse order. If we compare such devices with models of absorption or compression type by the amount of electricity consumed, it should be noted that the consumption of resources in the case of a thermoelectric cooler directly depends on its volume. This explains the presence of such cooling systems mainly in small-size refrigerators. 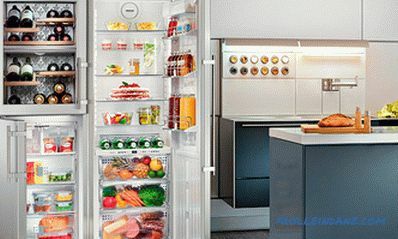 Modern manufacturers offer a fairly extensive range of models of refrigerators, differing both in the number of internal compartments and in their location. This, in turn, may affect the dimensions of the product. Such devices do not assume the presence of a separately located freezer. As a rule, it is combined with a compartment designed for cooling products, and in some models it may be completely absent. 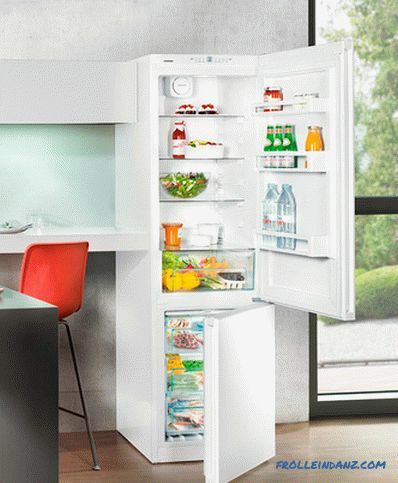 Today both small-sized single-chamber refrigerators and full-sized appliances are on sale.However, their technical characteristics may vary significantly. 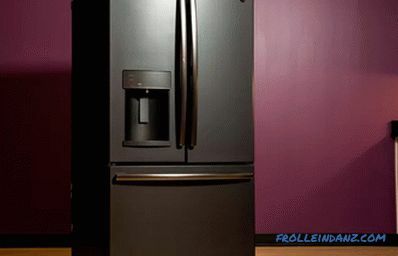 When choosing such a refrigerator, one should make a start not only from the number of intended users living in the house, but also from the free space in the room. 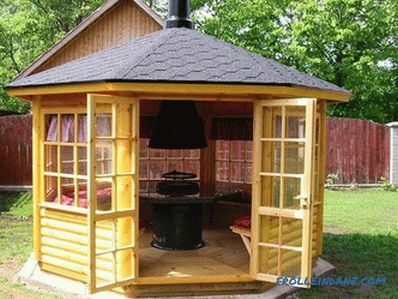 In most cases, single-chamber devices are perfect for both the apartment and a country house. Relatively low cost, as well as the minimum power consumption makes them quite popular among consumers. storage of vegetables, fruits and greens is carried out in the zone where the humidity indicators reach 90%. 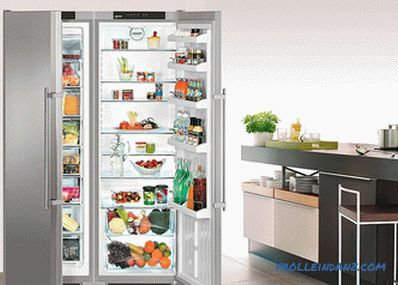 These types of refrigerators prefer to be used in families, where, in addition to storing ready-made meals, there is a need for harvesting one or another food product. freshness zone (also known as zero chamber). "). If there is a compartment for fresh produce, you can be sure that the useful elements found in vegetables or meat will be preserved. Typically, household appliances consist of three cells and have 4 doors. Models with a large number of offices are already classified as professional. 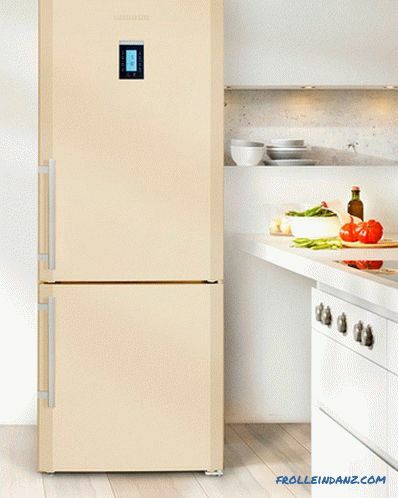 Premium-class refrigerators that came to the domestic market from America are large and quite spacious appliances made in the form of two-door cabinets. Both offices - freezing and refrigerating in this case are located vertically, completely occupying the left and right side of the structure. The width of such a device is much larger compared to conventional multi-chamber models, which requires additional free space in the room. On the outer surface of the freezer compartment door, as a rule, there is a dispenser that supplies cold water or ice cubes. The presence of two independent compartments makes it possible to store ready meals and semi-finished products in proper conditions. In addition, it is a great option for storing fruits and vegetables. In the process of purchasing such a refrigerator, you need to decide where the freezer will be located, in terms of its most convenient use. In modern models, in this way, compartments are assembled much less frequently than before. However, for those who mainly use the camera to cool the products, such a system of the location of the compartments is still relevant. The lower shelves are not always filled with food, as a result of which you do not have to squat or bend down to get them. 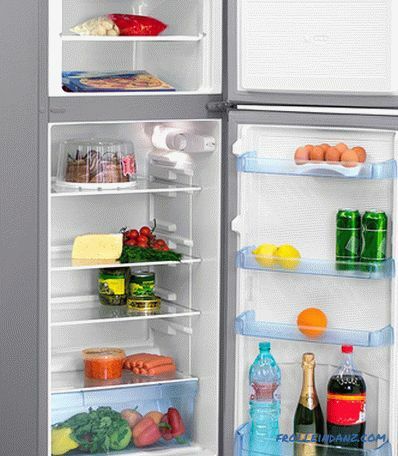 However, in some household models, the size of the freezer is often approximately the size of the main compartment. This arrangement is considered traditional for most modern appliances. In designs with the freezer being below often swing doors are installed. The presence of drawers allows you to store certain products separately. At the same time, everything that is on the shelves of the main compartment is the most affordable. 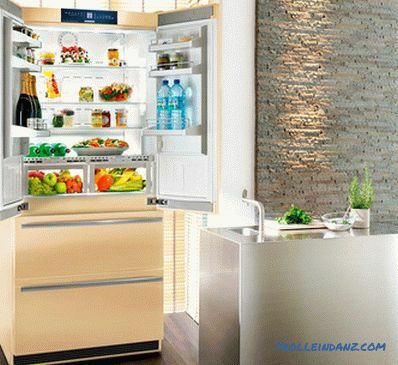 Refrigerators according to the installation method household appliance. The refrigerator can be located separately from the rest of the furniture or be built as part of the headset. The traditional installation option involves the allocation of a separate section on which the refrigerator will be located. As a rule, a place near an electrical outlet is chosen. It is necessary to maintain a distance of at least half a meter from the battery.In addition, it is not recommended to install the refrigerator close to the stove, especially in the presence of an induction hob, since a powerful electric appliance may adversely affect it. With this method of installation, it is possible to conceptualize the interior. The refrigerator is mounted in the kitchen furniture, and its frontal part is covered with a facade from the kitchen set. There are, in part, partially embedded models. In this case, the front surface of the refrigerator is not masked with a facade panel. However, it should be borne in mind that with a sufficiently high cost of such models, their useful volume is much smaller compared to freestanding structures. 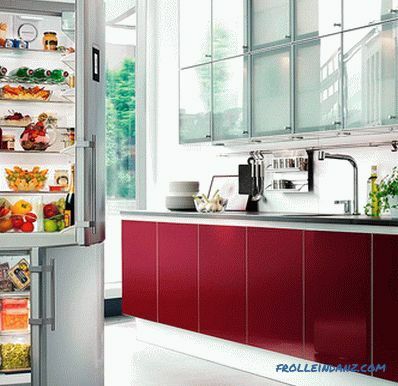 The demand for these types of refrigerators is due solely to the possibility of their full integration into the interior. The most popular devices among domestic consumers today are single-door devices. A blank door is still considered quite comfortable. 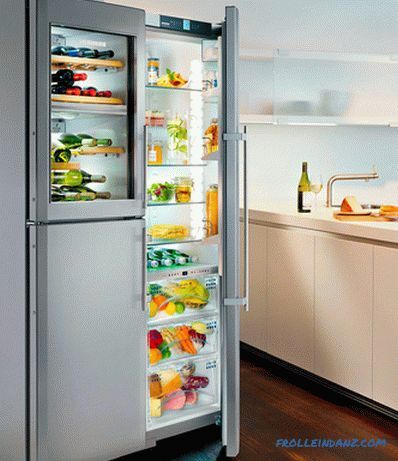 At the same time, the demand for refrigerator cabinets with two hinged doors is growing rapidly. Showcase-type structures, in which the doors are made of glass, have also become popular in recent times. 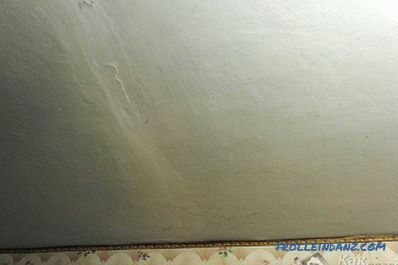 But in ordinary apartments such models are rarely installed, since they require regular maintenance. In this case, it is necessary to monitor the state of the surfaces not only inside the chambers, but also outside the structure. 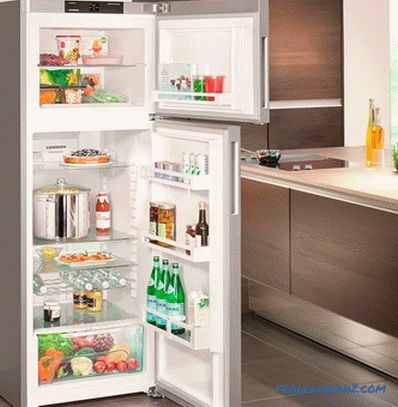 Traditionally, the average consumer imagines a refrigerator in the form of a white cabinet. This is what most of the models offered by manufacturers look like. 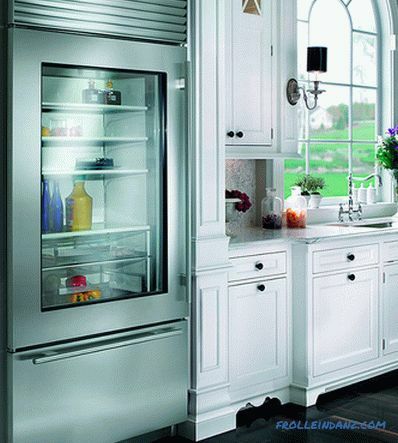 White color for the design of the surfaces of refrigerators was not chosen by chance. 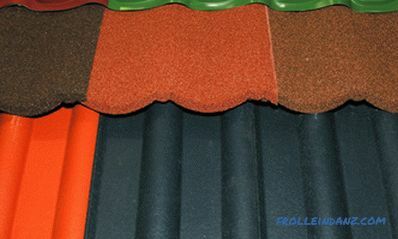 When the infrared radiation is reflected, the walls of the device made in bright colors are less heated, as a result of which the equipment does not experience a deficit of energy expended during the cooling process. Gradually, during the experiments, the color design of the case changed. 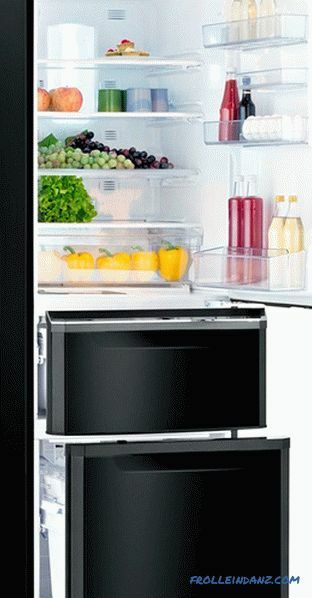 Began to appear red, green, and often black refrigerators. Various design ideas were implemented in the form of drawings applied to the surface. At the same time, one cannot say that colored models can boast of a rather extensive assortment. Therefore, the highest prevalence of white and silver products is still preserved. It should be noted that in the manufacture of silver cases, it is almost always assumed partial use of stainless steel. As a rule, it is used only for the door. This allows us to limit ourselves to a slight increase in the cost of technology. 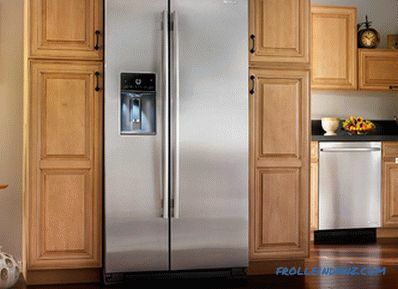 Refrigerators, the surface of which is treated with a special "protection against fingerprints", require minimal care.